New Superstorm Sandy photos are available for viewing on the Toms River Township website. The “Before & After” photos show the barrier island in a state of destruction, immediately after the storm. The bottom half of the photos depict the same area one year later. As always, if residents need help with recovery, they can contact the appropriate person at town hall to help them navigate through the rebuilding and/or decision-making process. To view photos, go to www.TomsRiverTownship.com and click on the “photo gallery” under the main menu. 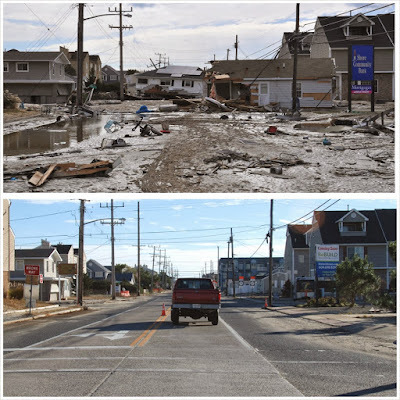 During Hurricane Sandy, homes were lifted off their foundation and then they drifted onto the middle of Route 35 in the Ortley Beach section of Toms River. One year later, the roads are passable and many homes are being rebuilt.